The audience is integral to Dartmouth Idol, as their votes in the semi-finals, along with those of the judges and a panel of Hopkins Center for the Arts employees, decide which six contestants will advance to the finals. In the finals, the audience is solely responsible for choosing the winner of Dartmouth Idol. Director and founder of Dartmouth Idol Walt Cunningham said that he was enthusiastic about the number of opportunities for students to contribute to Dartmouth Idol. “I’m proud to say that we have hundreds of students that will be involved in the process, whether it’s because of dancing, or the background or auditioning,” Cunningham said. Dartmouth Idol has experienced an increase in involvement over the years, with a greater number of both students and community members from the Upper Valley participating. Several notable alums have taken the stage, from Michael Odokara-Okigbo ’12 to Kevin Oh ’12. Odokara-Okigbo, whose stage name is Michael O., led the Dartmouth Aires a cappella group to a second place finish in the NBC show “The Sing-Off” in 2011. Odokara-Okigbo won Dartmouth Idol as a first-year student, something that Cunningham said contributed to his early onstage confidence as a singer. Kevin Oh, also a former Dartmouth Idol contestant, went on to win the seventh season of “Superstar K,” the Korean version of “American Idol,” in 2015. This year, Dartmouth Idol will continue to feature high-caliber performers, as students have to pass an audition process in order to make it to the semi-finals. “[Over] the last four to five years, there has been a consistent high level of talent, and the competition is there; I think that’s particularly exciting,” Cunningham said. Although Dartmouth Idol is exciting for audience members, it can also be incredibly nerve-wracking for performers. “I’m definitely a little nervous. I’ve never sung in front of probably more than 25 [or] 30 people,” semi-finalist Alexander Brown ’19 said. Brown sang with the Summerphonics a cappella group his sophomore year, and performing at various shows on campus helped inspire him to try out for Dartmouth Idol. Brown added that he is a fan of “American Idol,” and Carrie Underwood, a former contestant, was the first singer he ever saw win when he was in the third grade. For his audition for Dartmouth Idol, Brown sang one of Underwood’s songs. In addition to first-time performers such as Brown, Dartmouth Idol sees a return of singers who have been involved in the production in past years. Alice Bennett ’20 participated as a freshman and is now a semi-finalist once again. “Having done it already once, I would say it becomes a little less serious,” Bennett said. Bennett added that she is planning on using her experience this year to see how much she has improved since her freshman year, as she had laryngitis during her first semi-finals performance. Bennett is also a member of the Dartmouth Sings, which she enjoys participating in because she had never sung a cappella before college. Bennett said that she thinks her experience with the Sings will be helpful in this year’s competition. 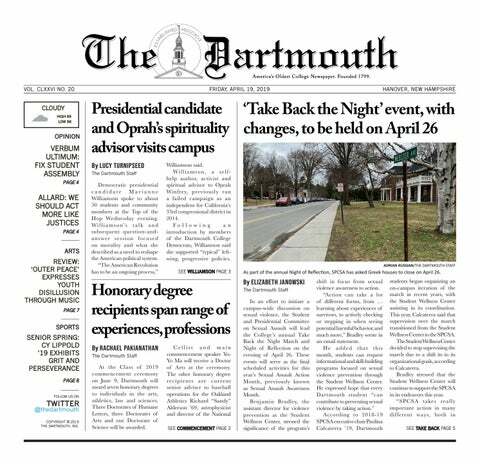 “I think it’s important for folks to understand that the experience students get is commensurate with the academic rigor associated with Dartmouth,” Cunningham said. The Dartmouth Idol semi-finals will take place in the Spaulding Auditorium in the Hopkins Center for the Arts at 8 p.m. on Feb. 1. Correction: The previous version of this article stated that the tickets to the show were sold out. This was incorrect; the tickets were not sold out and the statement has been deleted.